Usually at 13, the world - shrunken to a few city blocks of cocoon-cozy familiarity - offers a safe, stable, unassailable haven. Paradoxically, everything in a 13-year-old's world - an upcoming exam, say, or the best place to grab a pizza after practice, that new girl at school - no matter how trivial upon reflection, also takes on a life-and-death importance. Until reality sometimes encroaches on the sunny illusion. 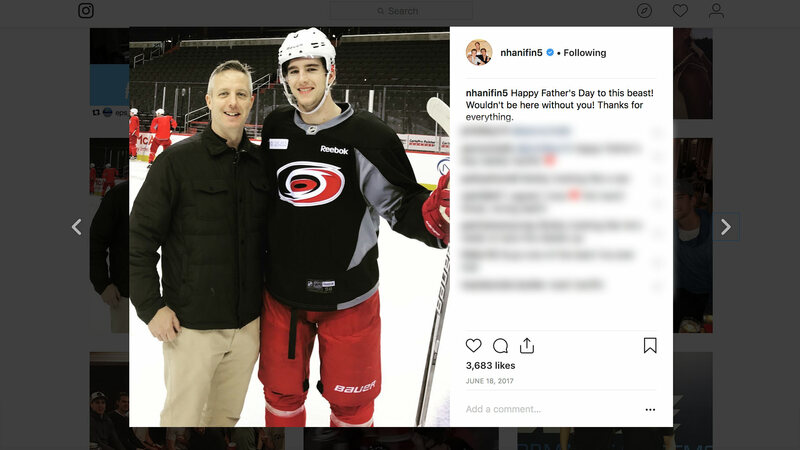 "I was definitely scared at first," is how Flames defenceman Noah Hanifin recalls the stunning news that his dad, Bob, had been diagnosed with cancer eight years ago. "He had colon cancer and kidney cancer. A serious surgery and treatment. "My dad and I are extremely close. He's been huge for me in my hockey. He'd take me to all my practices and games as a kid. "When he got sick it was tougher for him to do things like that. It was so hard to see. "And tough on my little siblings (brother Cole, sister Lilly) who didn't really know what was going on." Following Bob's diagnosis, surgery and a year of chemo and rehab followed. "It put a scare through everybody,'' says the family patriarch, from the Boston-area courthouse where he works. "I was young, 43 years old. So, unexpected, of course. At that point, Noah was in eighth grade at Saint Sebastian's. He was trying out for the varsity team. Around this time is actually when we found out, in October. "He was awesome through it all. He definitely grew up. Tried to help out however he could. I was really proud of him, of everyone. He was there for me. It helped me fight through it, too, making sure I was going to be around for my three kids. "Thank God everything turned out for the best." And, now, for its eldest son. "He loves it in Calgary," enthuses dad. "Canadian market, passionate fans. He loves the guys on the team, the leadership on the team. (Mark) Giordano, he's always talking about him. "Did you know he's played in Alberta before? 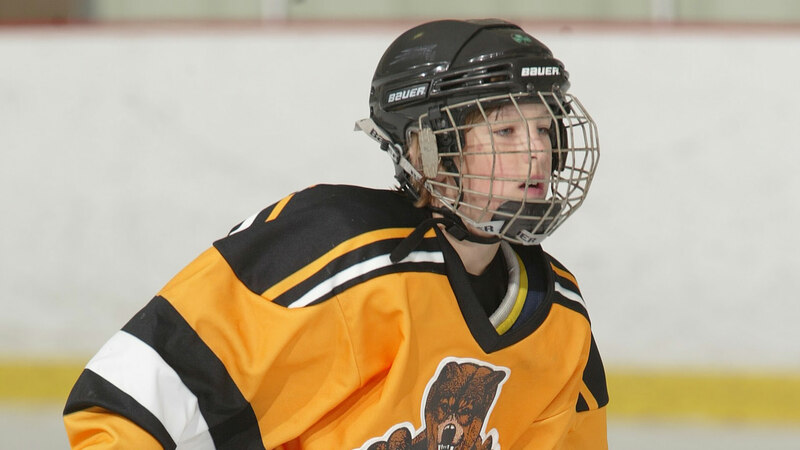 Yeah, in the Brick Tournament, in '07, when he was 10. For Team Alberta. They were allowed to add a certain number of players from elsewhere and they added Noah. Eric Morrisette was the coach. A few Calgary kids on that team. Nick Merkley, I believe. A few others. "So it's kind of funny that he's back in Alberta again. "Raleigh was great for us, an hour and a half away (by plane), but I'm extremely happy now. We all are. Everything happens for a reason, right?" Even, it seems, in the most testing of moments. Trace back eight years and Bob's cancer scare for anyone in need of evidence. "In some crazy way," he confesses, "the colon cancer probably saved my life. That's why I got scanned in the first place. "The kidney cancer, which wasn't related, would've gone undetected otherwise. "If I don't get that scan …"
He did. And everything is fine. Mom Tina arrived to help with Noah's move-in just before the team left on it's O.R.G. NHL China Games adventure. Bob was out this way to catch the Flames' home opener Oct. 6. "Fortunately, there are a lot of great hospitals in Boston," says Noah of the illness. "We have a big Irish-Catholic family, so I have lots of cousins, aunts and uncles. Everyone pitched in to help out. Having that family support, that bond, is very special. "My dad's sisters are nurses at Boston Hospital. So we had a connection there and my dad got a great surgeon. "I have a lot of unbelievable role models to look up to. My dad, of course. 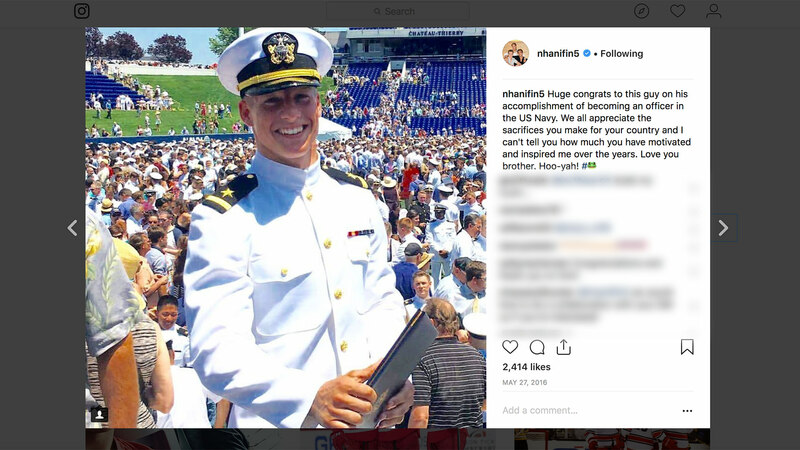 My cousin in the military, a Navy Seal - can't give you his name, sorry; I would if I could, but … - is someone I talk to a lot. Another cousin, Conor Joyce, grew up on the same street, smart guy, played football at Columbia. "My high school coach at Saint Sebastian's, Sean McCann, has been a mentor. Then there's Bill Burke, the headmaster there, who's been a huge influence in my faith. "I'm very fortunate in that regard." Over and above the obvious size and skill-set, there simply has to be a certain added level of tungsten-tough resolve that allows someone to fast track to the varsity team at Saint Sebastian's while only in the eighth grade, to the U.S. Under-18s as an underage for the World Championships and then at the collegiate level at age 17, thus becoming the second-youngest-ever player to lace 'em up for Boston College. "He's just always been a mature kid,'' says Bob. "And big for his age. In eighth grade, he was probably 6-1, 6-2. That's part of the reason, for sure. If he's a small guy, maybe it doesn't happen so quickly. But, being honest, I think the biggest reason was that maturity level I mentioned. "I don't know where he got that from. He certainly didn't get it from me. "I still think this is his first year in the league. I can't believe it's gone by so fast …"
On the campus of Boston College, of course, Jerry York has been bestowed legend status, for good reason. The only Div. 1 NCAA coach to reach 1,000 wins, a four-time national champion in charge of the Eagles. Over his 600-game career at BC, he's seen his share of special talents troop through the Kelley Rink at Conte Forum. "It's crazy to think back,'' reflects York, "but when Noah got here he was still a kid, just a puppy. Now he's still only 21 and playing in what, his fourth NHL season? "Johnny G (Gaudreau), as a comparison, was 20, 21, when he stepped into the NHL, right? That extra three, four years is big leg up in terms of maturity. "But Noah was physically very mature and that certainly helped him. His skating, right from pee wee hockey, has always been outstanding. He's got that stride, that power. "He had a remarkable freshman year at BC, given his age and the jump he was making from local high school. And it was a big jump. "He was probably frustrated the first half of the season, not getting the minutes he was used to. But after Christmas he got much more comfortable, and it showed. I'm sure it was very similar the next year (in Carolina)." Hanifin's shift to the collegiate level was initiated by BC, reaching out to gauge possible interest. "It was a tough call," he acknowledges. "I'd grown a lot as a player in the national program. But it was a personal decision: I wanted to go home and play college, play at BC. It'd been a dream my whole life. "I had to take online classes for my senior year and that summer so it was a lot of work. But well worth it. "It's something I definitely miss to this day, being on campus, watching football games in the fall, playing in the winter, going to class. A lot of my friends from high school are at BC now, as well. "Definitely a fun year in my life." The ensuing years have taken him to North Carolina as the fifth-overall selection in the 2015 draft, three years on the 'Canes blueline, a 2018 All-Star Game appearance and up to today, to a fresh start in a hockey-mad setting. When discussing Hanifin's sizeable upside, Flames GM Brad Treliving invariably circles back to a fierce inner ambition. "He's still a young, developing player but his mindset is simple: I want to be the very best,'' said Treliving the day Hanifin signed a six-year contract worth$4.95-million US annually. "Now a lot of guys have that same aim. But his physical tools jump off the page. And I believe he's driven to be very, very good." "It's just something I had installed in me as kid," reckons Hanifin. "I'm a driven guy. I always wanted to stand out, whatever level I was at. I never want to be satisfied. I don't want to be just another defenceman in the NHL. I want to have a great career. I want to win Stanley Cups. I want to win Stanley Cups here. York certainly witnessed that pitched degree of determination up close, when a rangy 17-year-old arrived on campus from the U.S. National Team Development Program based in Plymouth, Mich., eager to prove his mettle. In his only season at BC, Noah Hanifin adjusted well enough to connect for 23 points in 37 games. "Back then," York confesses, "I wished we'd been able to keep him one more year. I mean, it's very hard to play in the NHL, mentally, socially, as an 18-year-old. "But he made his decision and turns out he was right. It's worked out. It's been great to watch him mature. And he's really just getting started. "Coach Peters must've loved him because he brought him over from the Hurricanes. "At Noah's age, he could enjoy a 15-year NHL career, or longer. Hopefully he'll have a long, successful run with Johnny Hockey there in Calgary. "They seem to be off to a good start."